EL PASO — Eduardo Talamantes talks about his long-ago military service the same way he does his volunteer service at a migrant shelter today: He downplays the importance of both. 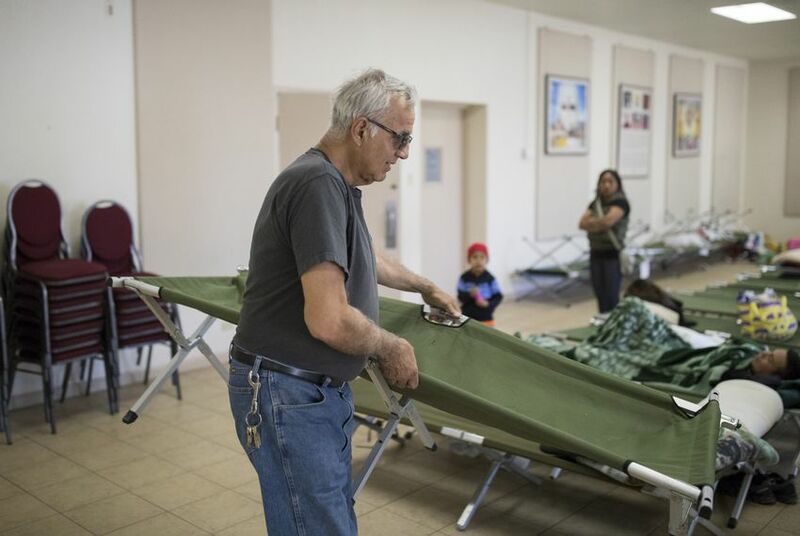 "Here" is the Catholic Diocese of El Paso’s main campus in El Paso’s lower valley, where on Tuesday the 69-year-old former refinery worker was a jack-of-all-trades at the shelter, which can house up to 100 people. “There he is,” he told a group of reporters after finding a migrant who had wandered off. “Let me make sure he gets his ride.” Later, he spotted four migrants holding fresh clothes and towels and led them to the showers. Talamentes might soft-pedal his role here, but shelter directors say he’s an important cog in wheel that has been spinning increasingly faster as the number of immigrant families crossing into this part of Texas to seek asylum continues to surge. Everyone involved in the system, from Border Patrol agents to customs officers to shelter workers, has been scrambling to cope with the mass of people arriving at the border. Most of the migrants are Central American families and unaccompanied minors, and their numbers have grown by 340%. 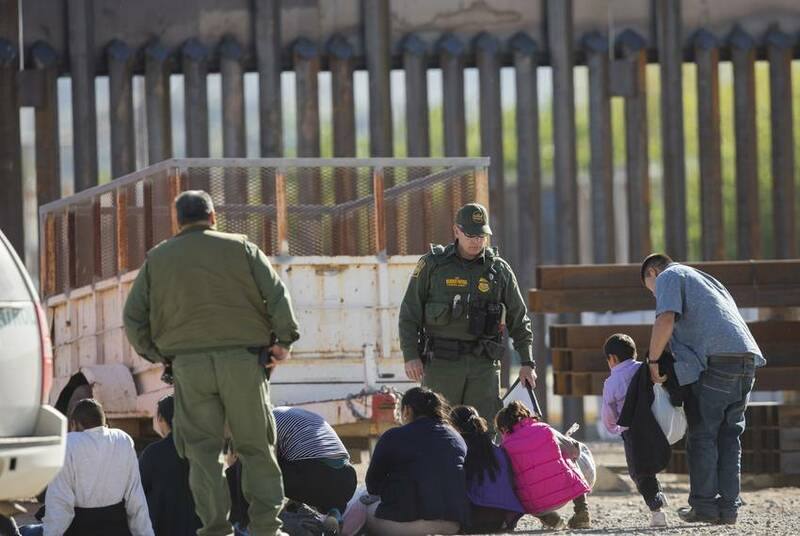 About 136,150 family units were apprehended on the southwest border between October and February, compared to 31,100 families during the same period the year before, according to Customs and Border Patrol statistics. And here in El Paso, the local Border Patrol sector saw its family unit apprehension numbers jump 1,698% over that same period. By last month, when U.S. Customs and Border Protection predicted it would hit a 12-year high with more than 100,000 apprehensions across the border, so many migrants were coming through El Paso that agents set up a military-style tent surrounded by chain link under a freeway bridge to hold the overflow. The surge has led CBP to redirect 750 agents from their positions at the ports of entry to help Border Patrol process the migrants, and it fed President Donald Trump's recent threats to close the southern border — a move that even members of Trump's party have said would wreak havoc on the country’s economy. On Tuesday, Department of Homeland Security Secretary Kirstjen Nielsen reportedly said the administration would treat the surge like a Category 5 hurricane and tapped Manny Padilla, former U.S. Border Patrol sector chief, to coordinate the federal response to the crisis, according to a DHS news release. It’s the humanitarian component of the situation that convinced Talamantes to volunteer at the shelter about three months ago. He describes himself as a patriot who's concerned about the country's direction and said he’s growing more frustrated with “misinformation” about immigrants and why they are leaving their countries. The surge has had volunteers and shelter directors scrambling for weeks to ensure that migrants have places to go once they are released from custody. 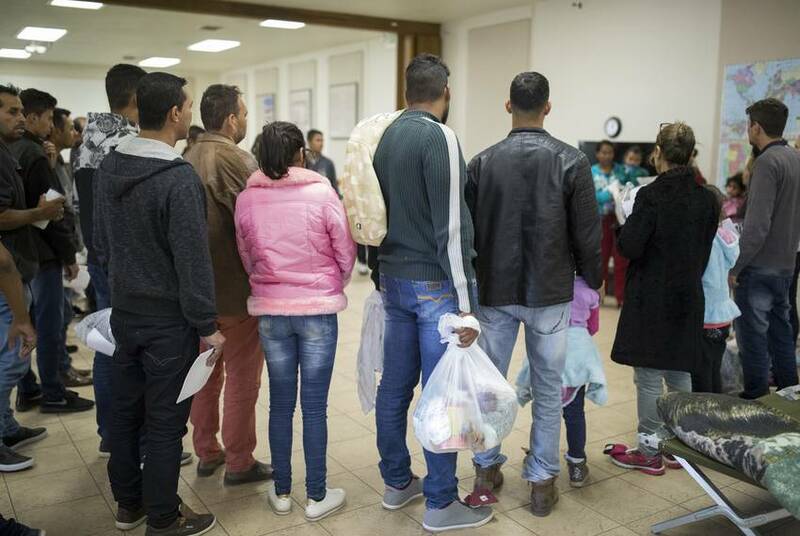 Ruben Garcia, the director of the Annunciation House, which operates a network of migrant shelters across the city, said his organization has spent about $1 million in five months just on hotel space to make sure migrants don’t sleep on the streets. Garcia only needs the hotels when the roughly two dozen shelters are at capacity. The vast majority of migrants don't spend much time in El Paso before they leave for other destinations around the U.S. But DHS announced a policy shift last week that could put more pressure on an already strained safety net: Instead of transferring migrants to Immigration and Customs Enforcement officials for processing after they are apprehended, Border Patrol agents are now releasing many migrants directly to the shelters. Garcia said that from March 27, when the policy change was announced, to Monday, Border Patrol had directly released about 1,100 migrants in El Paso. That’s in addition to the 3,725 ICE released during the same time frame. Garcia said the trend is worrisome because Border Patrol has little experience in helping release migrants in an orderly way and lacks the vehicles to take them to other cities when El Paso's shelters become full. Garcia said Monday that the shelters he works with are receiving an average of 500 to 600 migrants a day. So far, they have been able to manage the flow, thanks to the network of volunteers, but “I have no way to predict what we can expect going forward,” he said. Garcia's hopeful that a new shelter slated to open soon will help. He said the former warehouse, which will be part of the Annunciation House's network of shelters, will be able to house hundreds of migrants. “It gives us a cushion to receive a higher number of refugees should there be a sudden spike in the number of individuals that are being released,” he said. Meanwhile, Customs and Border Protection announced last month that a new government processing center for migrants is also in the works. That space isn’t scheduled to open for at least six months and could take as long as a year, U.S. Rep. Veronica Escobar, D-El Paso, told reporters last week. Dylan Corbett, the director of the Hope Border Institute, a local faith-based community organization, said El Paso leaders have been vocal in their opposition to closing the border or building border walls, but they’ve left the increasingly urgent task of housing migrants largely to the faith-based and nonprofit communities. “The most you hear is the mayor on TV basically kicking the can to Washington and saying, ‘The system is broken,” he said. A city spokesperson didn’t respond to a request for comment on Corbett’s remarks. The El Paso City Council voted last week to allocate $20,000 to hire a coordinator who will work with the United Way to find more volunteers to help house the migrants. Garcia said the county voted to provide an additional $20,000, adding that he was grateful for the efforts. As the surge continues, Talamantes said, he’ll keep doing his part as long as he’s needed. And he thinks others will, too. “People are good — they might slack off sometimes, but they’re good,” he said. Oceana, a woman from Guatemala who asked that her last name not be used, said Tuesday she had been at the diocese's shelter for three days. "We're very thankful" for the support, she said in Spanish as her two sons kicked a soccer ball outside one of the dormitories. "They've received us day after day, and we have what we need." Talamantes said that gratitude goes both ways.